We hope and pray that this email finds you in a state of good health and warmed with Iman despite the cold weather. Alhamdulillah our youth program is excited to announce its newest initiative for High School girls: Revival. We look forward to the participation of our High School girls and the support of their families. This is the spirit of Revival, ICN Youth’s newest initiative for High School Girls (and soon, Guys): an environment of beautiful company, engaging activities, and great food…all centered around developing a practical relationship with the book of Allah. The goal of Revival is to allow us to realize that the Quran is as relevant to all of us here in 2019 as it was to the Prophet (saws) and His companions, and to live in the shade of its beautiful guidance. 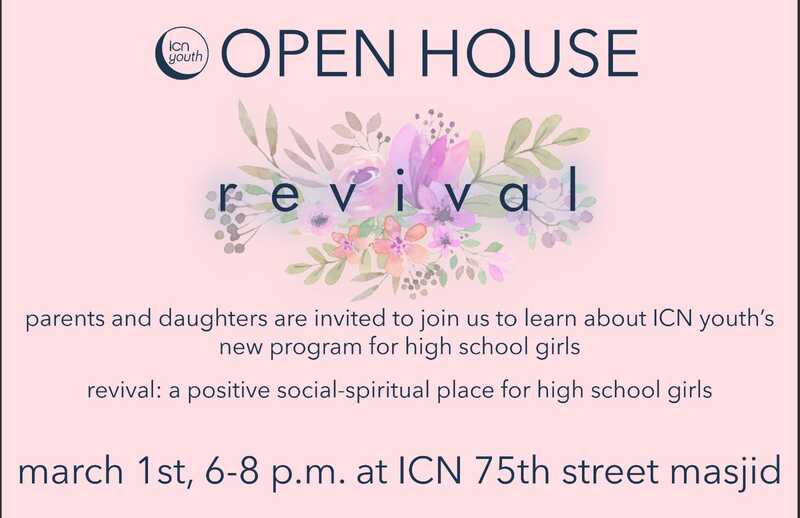 Revival will launch on March 1st at 6PM at ICN 75th St. for High School Girls and will be held every 1st and 3rd Friday of the month. There will also be a parent orientation on March 1st to introduce the program. Parents and families are welcome and encouraged to attend.